Gently cleanse your little one's hair with Johnson's® baby Gold shampoo. Rinsing easily to leave baby's hair feeling super soft with a unique baby fresh smell, the cleansing NO MORE TEARS® formula is as gentle to the eyes as pure water. 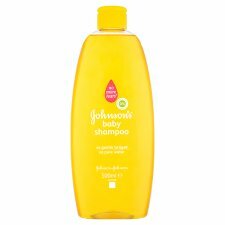 Soap and paraben free, Johnson's® baby Gold shampoo is ophthalmologist tested. WARNING: Keep out of reach of children. External use only. To Use: Wet baby's hair, pour a small amount of shampoo onto hand, gently lather into hair, rinse and snuggle.